On the occasion of Nithiin's Birthday on March 30, the makers of Bheeshma have unveiled the Title Logo through the Twitter handle. The film has 'Single Forever' as the tagline. Director Venky Kudumula who shot to fame with Chalo movie is directing Bheeshma. The film is touted to be a hilarious commercial entertainer. Rashmika Mandanna is zeroed in as the leading lady. Naga Vamsi is producing Bheeshma on Sithara Entertainments Banner. This movie is scheduled for a release by the end of 2019. 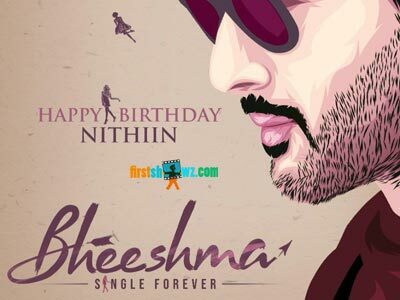 We at Firstshowz.com wish Nithiin a very Happy Birthday and a blockbuster year ahead with Bheeshma.